Up-to-date issues and standards relating to construction safety. Construction Safety and the OSHA Standards prepares students to handle all of the safety, health, and compliance responsibilities of even the largest construction projects. 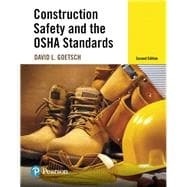 In addition to providing current coverage of the latest information and requirements in the OSHA standards for construction (29 CFR 1926, Subparts A through Z plus AA and CC), the text also includes essential safety topics not covered in the standards, such as accident causation theories and ethics and safety. Included are chapter summaries, key terms and concepts, review questions, critical thinking activities, and application activities to ensure understanding of the topics presented in each chapter. The Second Edition includes important new coverage and updating throughout, including a new chapter on innovative approaches to construction safety that go beyond just compliance (new Chapter 3). David L. Goetsch is the author of more than 50 books on safety, quality, and organizational excellence. After working as a safety, quality, and engineering professional in the private sector, he has spent the past 40 years as a professor of safety, quality, and management at Northwest Florida State College. He is also a widely sought corporate consultant in these fields. 3. Pro-Active Safety Strategies in Construction: Safety Culture, Total Safety Management, and Other strategies.